Between 50 and 60 feet, we enter the ultimate in long-term cruising boats. Boats which can be managed shorthanded, and which offer incredible volumes and top-level performance. With this brand new 53-foot catamaran, Catana is presenting a handsome, powerful boat for all lovers of long-term voyages afloat. A boat thought out and developed in-house by the company’s R&D department, assisted by several architects’ offices. 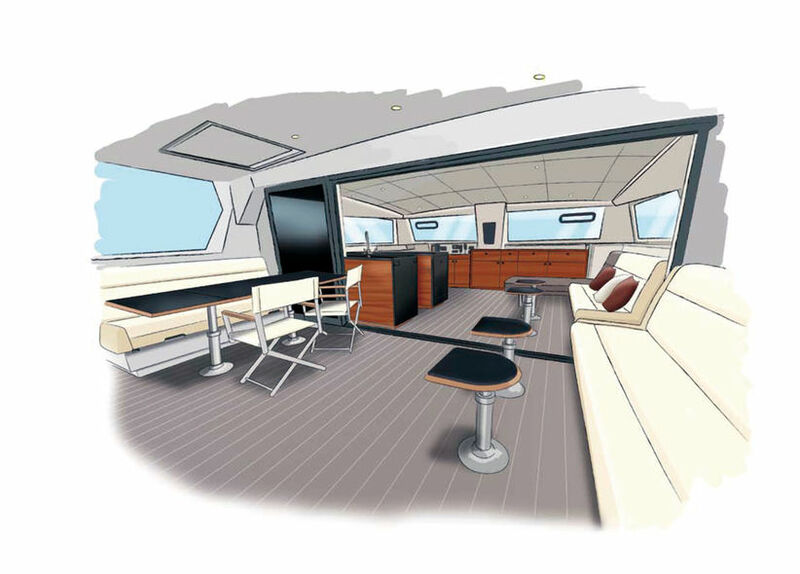 We find a good number of ideas which were already present on the 59, a precursor in the more than innovative way of managing the space aboard a catamaran, by offering a unique volume between the salon and the cockpit. The 53 of course uses this concept once again. The other new feature that first appeared on the 59 is the use of curved daggerboards, which, in addition to giving the boat the looks of a ‘racer’, allow an improvement in the boat’s performance. Finally, as the 53 is aimed at long-term cruising couples or families, it is particularly easy to handle shorthanded, and there is an excellent view over the water from wherever you are aboard, necessary for safety! The 53 is a boat which has inherited the Catanas’ DNA, to take you around the world quickly and safely. As for the 450, Lagoon is offering its 52 in an F version with a flybridge, and this new version, called SporTop, with a traditional steering position against the coachroof bulkhead. The idea is of course to meet the needs of a clientele looking for a boat to go long-term cruising as a family, and wanting easier communication between the various crew members. With this new configuration, the rig is also lowered, allowing pitching to be reduced still further and making manoeuvres on the boom easier, whilst keeping the same sail area and the aft-positioned rig which caused a sensation when it came out. Another advantage – the bimini can now accommodate a large area of solar panels, to increase the independence of this easy to handle ocean cruising boat, with its self-tacking jib and shorter boom. 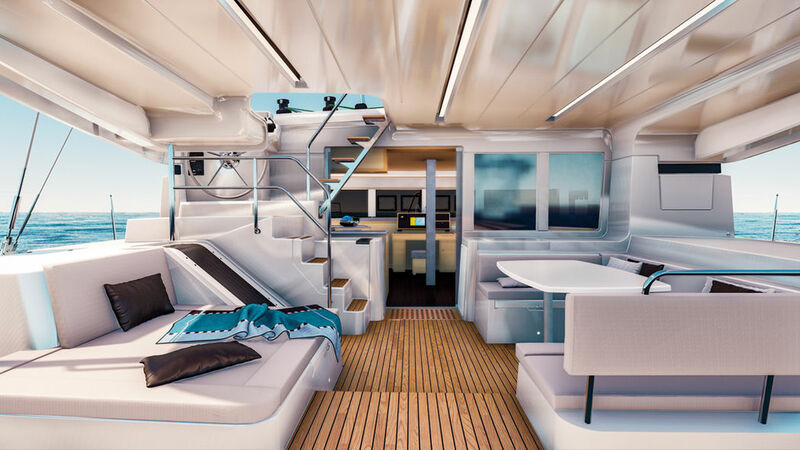 Finally, we find once again the comfortable and luxurious interiors designed by Nauta Design, offering ergonomics and management of the different areas which are particularly pleasant to live with, both at anchor and at sea.